Mar Dixon is a consultant with a passion for helping museums share what they do with the world. 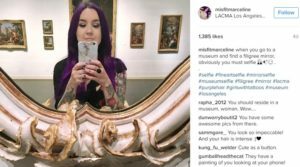 She created the popular hashtag #museumselfie and @52Museums, an Instagram account for weekly takeovers by museums, both of which have gone viral. A social media maven, Dixon believes in the power behind online storytelling and “going where the people are.” But there’s more to her than her online know-how. Museum Revolution talked to Mar about her creative ideas, how she helps museums reach new audiences online, and the trends she is noticing – and spearheading – in the digital world and beyond. What is the inspiration behind #museumselfie? Mar Dixon (MD): I run a website called Culture Themes where once a month there is a new hashtag. I was trying to decide what to do for January and I noticed that “selfie” was the Oxford Dictionary word of the year. So I decided…I would use it. What is the inspiration behind @52museums? MD: I feel that sometimes the culture sector isolates itself and so observing other sectors is one of the things I like to do the most. I was out with a friend of mine. He runs @52quilters [an Instagram account] where once a week somebody who quilts takes over the account. I was sitting there thinking “why can’t museums do that?” And he goes, “Museums already have an Instagram account. This is because these quilters don’t really have an account but it’s a great introduction for them.” But I just started @52Museums because although museums have Instagram, they also have policies and procedures to follow with those accounts. It’s been hugely successful. We just reached 10,000 followers which is pretty amazing because there is no advertising, there’s no commercial budget and everything I do in terms of hashtagging is free. It was an interesting experiment and already there are enough [museums signed up] for me to last until 2019. 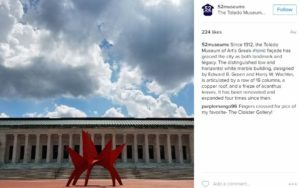 You seem to have a willingness and ability to be creative on social media with museums. What drives that? MD: It’s about going where the people are. My background is in IT and I used to do a lot of stuff on bulletin boards and message boards back in the day. And then social media happened and it was a great natural transition from what I was doing to what was happening in the world. Instead of me knocking on doors, I just say one thing and whoever wants to pick it up and share it, can. It’s changed the way we work and how certain things can get done. 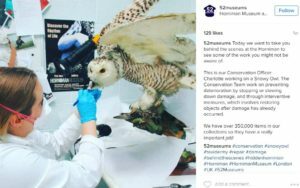 What trends have you noticed with museums in the digital world? MD: We’ve done social media and in-house tablets. We’ve touched the cusp of wearable technology. 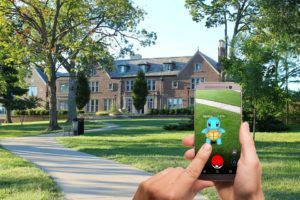 Some of the talk is with AR and VR, especially with Pokémon…and how we can jump on the bandwagon with that. We seem to always try to jump on a trend instead of trying to be the trendsetters. I’m not sure where AR and VR are taking us. I can see AR working better than VR because people don’t really want to have a siloed, insular experience with the virtual reality goggles. So AR has a little bit more of a team building aspect around it. I also think there is a lot of work that can still be done on social media. We’re streaming now which has been brilliant. We can bring behind the scenes moments to the front door of everyone. I think what needs to be done…is we need to keep looking in to those different sectors and look in to tech and look at what they’re doing – not necessarily jump on the bandwagon but morph it in to what could work for your collection at that time. I’m still really in to that fact that people are wearing Fitbits and all these wearable technologies without even realizing they’re wearable technology. Museums aren’t doing a lot to collaborate with that. What initiatives have you been a part of in regards to museums and digital? MD: I get to work with some of the companies who are trying to put out such technology as Tango [a mapping tool allowing people to explore museums using navigation, added information and virtual objects]…There is a lot of work that is happening with different technology in museums right now but I feel we’re at a plateau where we have to step back and take a break…and set a goal of what we want to achieve. Interestingly enough, audio guides are still a big thing. People still buy audio guides when they go places. They don’t want to download apps on their mobiles. Because I travel internationally a lot, I don’t always get a sim card when I go to a different country. I won’t have Wi-Fi. I’m not going to use my data to download an app for you but I will go buy an audio guide and get the information. What would be interesting is if more was done with the audio guides where we could get more data…about where I’m going or how long I’m staying at a certain painting. There’s some research that I’m trying to pull together with a company right now in Belfast called Sensum. They measure biometrics and emotional behavior. We are trying to tie in recent research where if somebody is looking at a painting for ten minutes we can see if they liked it or if they maybe were just checking their phone. What do you love most about museums? MD: I think museums are a wonderful playground in many different ways. They’re one of the most unique places, with such great diversity. Whether you’re a school kid, or a teenager wandering in just to have a look at something, you get inspired…It’s a great test bed because of those people coming in. It’s a great test bed to try out different technologies. As digital tools continue to develop, integration of technology in to museums will be critical. Mar Dixon’s work has been an inspiration to museums all over the world but even she knows that balance is key. Instead of hastily jumping on a trend, museums should be making strategic decisions about what technologies to implement and where. Does the technology help tell an artifact’s story better? Does it help a museum reach untapped, niche audiences? From social media to AR, it’s how we get collections and digital tools to work together cohesively that will matter most. How has technology successfully played a role in your museum’s mission? Share with me in the comments below. Being an avid student of life (no sheepskin all self taught) visiting many places are physically difficult. The ideas of M. Dixion applied are changing the ability of those who want to learn, as well as showing many that learning is fun, I have the utmost appreciation for ideas realized. The past is the future, now so many new ways to embrace!